Nice quality pin made by Monet. 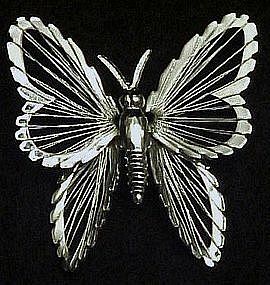 Shiny silvertone, and the delicate wings are made of fine wire. Excellent like new condition. Measures 1 3/4" x 1 7/8". Nice pin back closure. We have the goldtone color pin that is identical also. Silver is shown in photo. Both are stamped Monet. Please specify color.